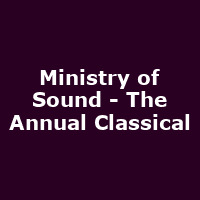 "The world's most iconic dance brand, Ministry of Sound, proudly presents The Annual Classical, the orchestral reimagining of the best selling dance music compilation series of all time, 'The Annual'. DJs include Seb Fontaine, Judge Jules, Brandon Block, Dave Pearce, Smokin' Jo. The 2019 Annual Classical will feature some of the biggest dance tracks from the 90s which appeared on the early chart topping 'The Annual' compilations. Performed by the 50 strong London Concert Orchestra, re-live and re-experience the hits such as The Chemical Brothers - 'Hey Boy Hey Girl', Dario G - 'Sunchyme', Faithless - 'Insomnia', Fatboy Slim - 'Right Here, Right Now' and many more."